This newly manufactured 223 Remington ammunition is PERFECT for target practice, range training, or plinking. It is both economical, reliable, non-corrosive and is produced by one of the most established ammunition plants in the world. The Tula Cartridge Works plant was founded in 1880 and is currently one of the largest ammunition manufacturing plants in the world. The Tula name has gained a following worldwide for its rugged, reliable, and economical product. This cartridge complies with CIP requirements and the casing features a polymer-coated steel casing. The projectile features a bimetal jacket (contains steel and copper) and a lead core resulting in excellent ballistics characteristics. Didnt have any problems with this ammo. It runs fine through my ar. Good quality. Great price. No problems with misfired or cycling. Will buy more. Love LAG!! The ammunition is ok but accuracy is greatly lost compared to higher quality rounds. The cost is super cheap though so if you aren't trying to hit small metal plates at 100 yards like I am you will still land on paper. These rounds shot a grouping of around 2-3 inches out of my Remington 700 SPS at just over 100 yards where as my PMC brass and American Eagles shot sub MOA groupings consistently. 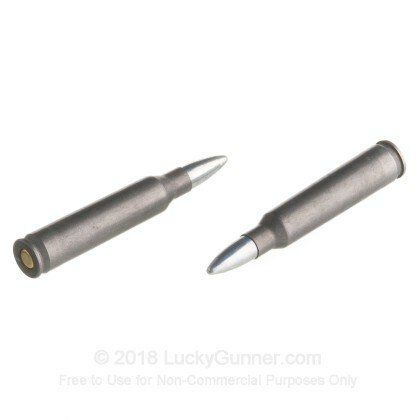 For just range day ammo and shooting paper this is a decent cheap alternative to buying at .50 cents to $1.00 a round but for competition and hunting I would stick to something a bit better. I have used similar ammunition in my AR-15 and it fired out of that platform with relative extreme accuracy so perhaps rifle to rifle it may vary for you. I have run this in the old Mini-14 old SS and black shot 500 in each 1 day with my baby girl who just got back from Iraq. We were shooting 100 yards and she said by looking it was 90 meters away the targets. No scopes on them and all 500 in each one not 1 fail a quick in out hit the target right on every time with stock open sights. After when we went to clean them the guns were not even dirty I could not believe it.I use to shoot my friends Dads high power reloads with a 5 foot flame out the front in Daylight. No flame with this ammo and not as loud but 1 half inch groups I cleaned the barrels the patches were still white.The mini-14 SS is 40 years old the black one is way older then me with the flash suppresser and Bayonet lug welded on from when it was made.its like new to he hardly shot it as he had a 200 acer Farm and many guns so he sold it to me way back and his Son was my best friend RIP.If you are having problems it must be the new Ranch Mini-14 I don't need ear plugs with this stuff its just a bit louder then 22 LR or hornet. I even set the SS one in a puddle safety on for 3 Minnets with 10 shots picked it up tipped it down then shot all 10 no problem.So for the price and I don't reload them just cant beat it.When anyone trys new ammo just buy a50 or so and see if it works in you gun then you are not stuck with it all.Back in are day 45 years ago or so the 223 best brand was like 10 or 20 cents a shot.Just be carful out there if one gets stuck and you shoot again by by barrel . The entire process, from the time I clicked order to delivery, was no more than 2-3 days. I will definitely do more shopping on Lucky Gunner. Cheap prices also. Good stuff. Great range ammo. My sig sauer 556 and ruger 556e love it. I would say u get what u pay for but it's only slightly cheaper than a great quality pmc box. Shot about 40 through my carbon 15 they fed flawlessly, no ftf or fte. They are dirty and not accurate, at 50 yards I had 6" groups with my pmc I had 2" groups. My advice is spend the extra dollar and get the pmc, and the plus is you can reload the brass casing. Not the highest quality of ammunition but very good quality for the money in my opinion. I've currently run approximately 400-500 rounds of this through my S&W M&P15x with zero failures to fire or eject. The accuracy is decent but being cheap mass produced ammo I wasn't expecting to be surgical outside of 50 yards. The only real problem I have had with these rounds however is they are dirty. Very dirty. Fortunately I enjoy cleaning my gun after being on the range however so it's easy for me to look past this issue. No misfires. Only malfunction was because of my ejector nothing on the ammo. It's cheap and cycled well for the 80 rounds i moved through my AR. You get what you pay for and it was cheap ammo and did as expected. Definitely not the best, but adequate and economical for indoor target practice. Just put 60 rounds through an AR-15. No mishaps but very dirty when cleaned the AR. 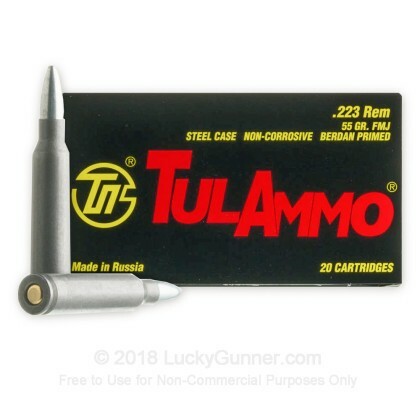 I would rather shoot a brass .223 cartridge that is American made than the Russian made steel TulAmmo. But cost sometimes dictates in today's market. 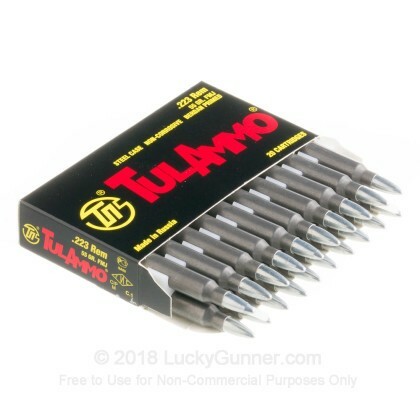 I have used this Brand of Ammo for many years now and never have I had any type of problem. I have Four different types and brands of Rifles plus one Handgun. While not match grade, for plinking this is great Ammo. Bought 5 boxes to try in Savage Axis. Out of 40 rounds, had 4 ftfs and 5 fail to eject. I had no problems like this with brass cased ammo. Accuracy not good. At 50 yrs. 10 shot group was 8". No more of this for my rifle. This was not purchased thru lucky gunner, just my experience with this ammo. I bought this ammo. Shot it through a Mini 14, the shell exploded in the chamber and had to take the gun in to a smith for extraction and repair. I also had one blow in my AR the same day,thankfully not as bad. You get what you pay for. I've used this stuff before in my Rockriver. It ate it up and spit it out with no problem. Yes its not match grade but when you see blue helmets coming it will get the job done. I would have given it better value but this stuff isn't as cheap a box any more. Thanks Lucky Gunner for the great service. Fairly accurate, but in my DPMS AP4 about one in every hundred rounds has to be driven out with a cleaning rod. Not good enough odds in a fight for me. I'm selling the remainder of my purchase. I bought 100 rounds of this and will never buy this ammo again. There was at least one bullet in each box that was recessed too far to shoot and had to be physically removed to continue firing. You get what you pay for and this is cheap. Functions flawlessly in my ARs Very accurate! Great value. not great. you get what you pay for. I've shot tons of this stuff in my DPMS AP4, Mini 30, WASR 10, S&W M&P 15, and SKSs. Never had jams or misfires and the accuracy isn't bad at all. I have seen the new Mini 14 tactical have issues with it however, but they tend to like better grade ammo. For the price this stuff is the best deal out there. Try 20 rds and if it doesn't work well then your out 5-6 bucks...nothing to cry over. Okay for the price. Not very repeatable shots!! Nice ammo for just plinking. Using a Colt CAR A3 with 24" H Bar Elite. 556 barrel. At 100 yards I am getting 3 to 4" groups on 5 shots with full bench rest. I have been cleaning barrel every 5 shots with bore snake. Barrel has 1in 9 twist so I am going to try some 62 grain .556 and see how it prints. I have not experienced any feed problems. My gun is a Colt CARA3 with a .556 barrel. Nice stuff to link with and so far I have had single hole shots at 200 yds with a bench rest. My friend has experienced jams with his. 223 barrel on a Mossberg gun. Hopes this helps you. Lucky Gunner has great pricing and fast economical shipping. I've shot over 200 rounds in my AR15 with no jams, no miss fires, no problems. I've also shot Federal ammo and the Tula does seem dirtier, but that's not an issue for me as I clean my firearm after every outing. It all depends on your chanber specs , mil spec chambers are looser and they eat it like a fat kid with a candy bar. It won't eject in an NEF 223., because it is tighter. This ammo is not for picky guns. That needs to be said to start. 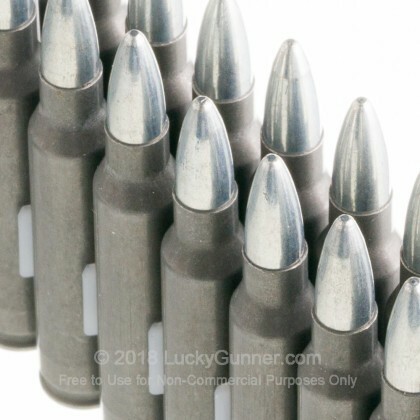 Guns like the Ruger SR 5.56 and Mini-14 are great and need good ammo. The ST-15 uses an A2 gas system and runs anything. Tula fired perfectly and had good accuracy from what i could tell(i used iron sights). 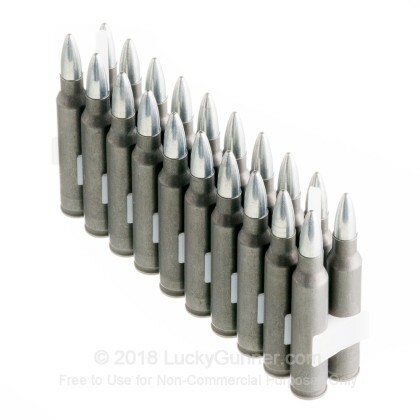 This ammo would be fine defensive ammo in a gun that could use it. I destroyed a 6in thick slab of concrete in twenty rounds so it hits hard. I recommend buying a small amount like 40 or so to make sure your gun can run it. Great ammo for a great price! Ive been shooting this stuff through my sig sauer Ar-15 and its been great. Haven't had many issues with it. mag. then the casing will not jam. however i will not buy any more of tula 223.
i used it in a ar15. Great Price, good product. Anyone having problems with ammo Jamming needs to understand that there are different chamber tolerances in different guns. MilSpec are looser, and Rifle varients are tighter. Not blaming the gun, just sharing a fact. jammed up both the AR15 and mini 14. atleast 1x per 3- rnds. Jams up in AR-15's and Mini-14's about 1 round in 30. Wish I hadn't bought a bunch of this as my blastin' ammo. Will try to unload or may keep as emergency stock. Winchester white box isn't that much more at WallyMart. I've shot about 1000 rds of this ammo with out any issues. I think its a bit more dirty, but just clean your gun. If youre like me and like to shoot your AR with out breaking the bank, use it. Please take my advice this ammo is not worth 1 cent a round. They also sell this ammo at Walmart. I have had HORRIBLE problems with Russian made ammo. This particular ammo caused my new Bushmaster AR-15 to jam up two times. Both times the bullets got lodged in the chamber. I took my gun to a gun smith the first time and he said he had heard about this ammo and its problems. He worked on the gun, cleaned it, filed down some parts. Then I tried it again with the same ammo and had the same problem. So I cleaned my gun and tried Federal brand - ZERO PROBLEMS - From what my gun smith told me Russian ammo is not made to the same specifications as US made ammo. I bought 120 rounds for $ 25. Could not pass up that deal. This stuff ran great in my DTI 1/7 chrome lined M4. Accuacy was 1" to 1-1/4" @ 50 yards off bags. It exceeded my expectations for cheap ammo. As good as any of the the Bear (Brown Silvers or gold) & cleaner than Wolf. It is better for me than white box - since I don't have to pickup the brass! A: No, this steel cased 223 ammo manufactured by Tula is not corrosive. 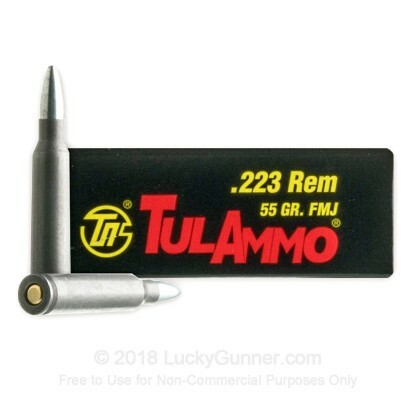 We also have this 223 Rem - 55 Grain FMJ - Tula - 1000 Rounds ammo in stock in a bigger quantity.